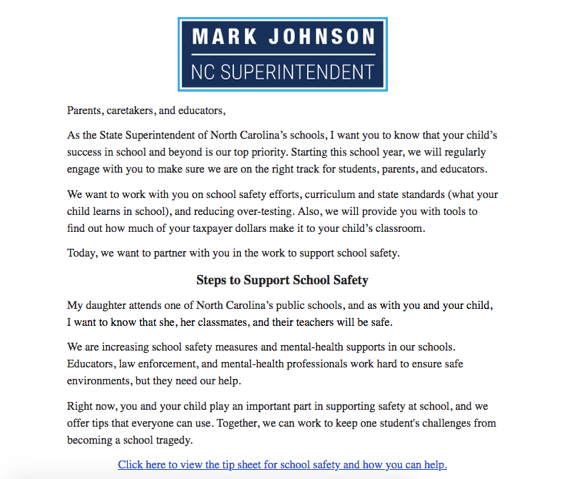 This message would alarm most parents, perhaps expecting an update about threats to school safety or specific action steps the school plans to take. Instead, Johnson offered tepid commitments in a form email that one expects to receive in campaign correspondence, not an educational necessity. Johnson, with likely 2020 aspirations, may be testing the waters of the DPI listserv as a way to get his name out. It is not as if Mark Johnson has been free from scandal. In September 2018, Johnson appointed Joe Maimone as his chief of staff, the same man who once claimed that public schools were “milking” federal free and reduced lunch dollars. Moreover, Johnson and Maimone are not so far separated from the Charter School Industrial Complex™, or TeamCFA and Achievement for All Children, a network of charter schools funded by the religious right. Is there an emergent policy or news update I need to inform parents or caregivers of? Is there a change to protocol? Am I telling parents or caregivers something they don't already know? If there answer to the above three questions is “no” perhaps Johnson may think twice about using the DPI listserv as his personal blog.